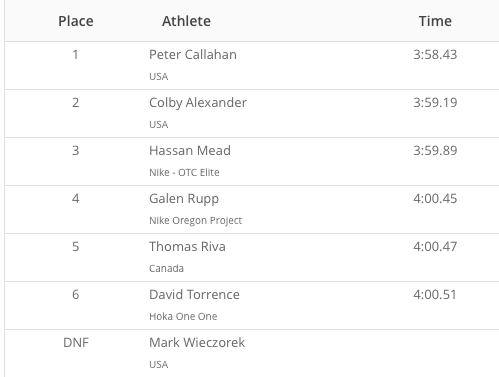 Galen Rupp 4th in "ThrowDown"
That appears to be the first proper sub 4 for Mead, though he ran 3:38.high last year. Hassan Mead is a very quality runner across the board. I bet he will be under 27 in his lifetime. 4th for Grupp is pretty devastating in any event. I’m sure things in the media have taken a mentally debilitating toll on him too. Probably a combination of that plus the fact that he is a new father to twins (they are ~1 now). I think many people have overlooked that entirely since the doping accusations have been front and center all summer. Seems like it would a) be something that would take a serious adjustment on his part (babies don’t care if you need to sleep for 10 hours in an altitude tent, if they are hungry, they wake up and cry); and b) is likely at least part of the reason he hasn’t been in Europe racing this summer. Also, I wouldn’t look too far into this race. Although it was far from great, it probably served primarily as a rust buster for World’s. You can have a great block of training, but if you don’t race for over a month, the first one back isn’t usually perfect.